According to the calendar, we are a month into spring, but the weather here in New York doesn’t seem to agree. One day it’s freezing, and we’re frantically turning up the heating, wearing fuzzy socks and warming our hands over cups of tea, and the next we go out in short sleeves and want our coffee on ice. Last week, on my way out of the house, I opened our coat closet out of habit, and then let go of the knob, telling myself I could leave the coat behind. I ended up running all the way home from the supermarket, freezing. And while I’m stuck in this limbo between winter and spring, the ice cream truck that comes jingling through our street every day has another problem altogether: it’s sure it’s summer. 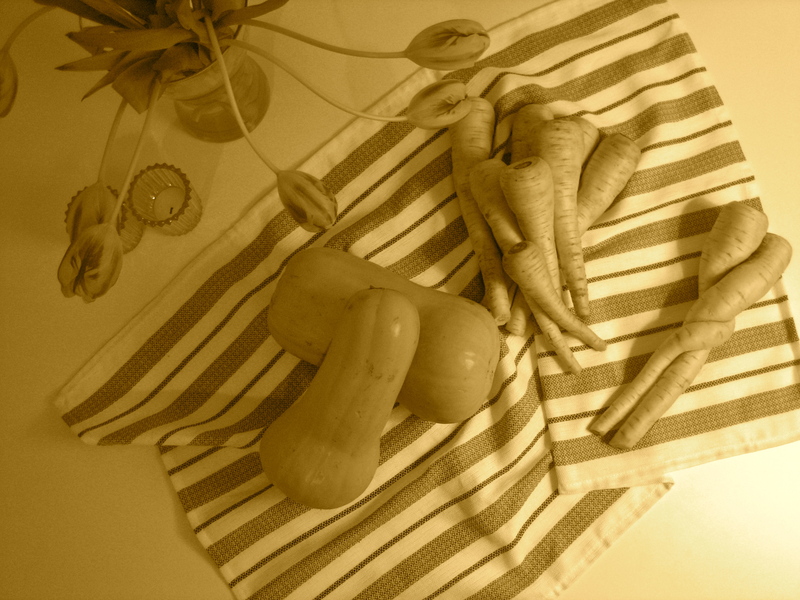 This week it seemed that everyone on the web was roasting root vegetables, and I got frantic. Maybe it’s the drama of their season being almost over, but when I saw this post on parsnips, I just had to make them right away. It didn’t help that Molly’s post was a veritable ode to winter, with such phrases as “no one ever, I feel I must state for the record, goes gushy over sitting around the A/C”. That’s it, I told myself, lacking a fireplace, I was going to milk my root vegetables, and my oven, for all their worth. I walked over to our little grocery store (coat in tow), and picked up butternut squash and parsnips. I had never cooked with parsnips before; I have never seen them in Israel, and although I had noticed them here, they had yet to pique my interest. That is, until I saw them that morning, and realized their days were numbered. I felt like a student staying up late the night before a deadline, roasting away my squashes before winter is gone for good. On my way home, I saw a little boy, maybe four or five years old, walking with his mother. She seemed harried, and urged him to hurry up. I slowed down my pace and eavesdropped a little, he looked all riled up, and, still feeling guilty over not intervening in a terrible tirade I witnessed between a very abusive husband and his wife, at Ikea, of all places, I wanted to make sure everything was ok. The little boy was gripping a fence and looking intently at something laying on the grass on the other side, and getting all worked up. “Why? Why do people do that? It’s NOT nice,” he said, his voice reaching the tantrum-like pitch of a child whose mom just said no to that oversized and overpriced truck in a toy store. I followed his gaze and saw it was directed at an apple core. It’s too bad his mom had already turned the corner, and missed this precious moment. Apparently, she’s doing a pretty good job. When my parsnips were in the oven it started pouring, and I mean pouring, with a few bolts of lighting, even, for good measure. I felt vindicated. All this to say: I roasted parsnips. They were delicious, just caramelized around the edges, the insides yielding. I closed my eyes, trying to pinpoint the flavor for you. The closest I could get was a fresh cinnamon-raisin bagel, those raisin-less bites, where there’s just a hint of cinnamon, evasive, teasing, and the bite is pleasantly toothsome. 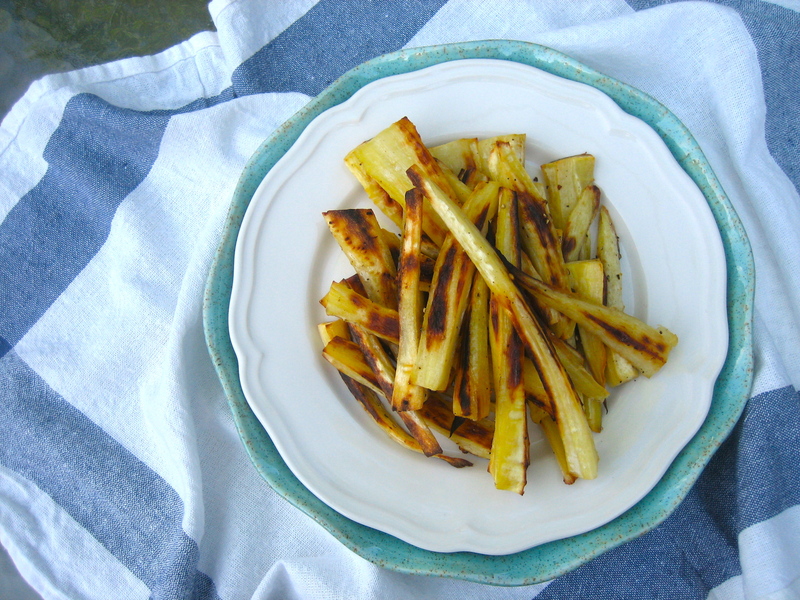 In other words, I roasted parsnips and you should, too. You know, before spring gets here with all of its perky greens. Hurry up, the deadline is looming. Preheat your oven to 425F/ 220C, and position a cooking rack in the bottom third of the oven. 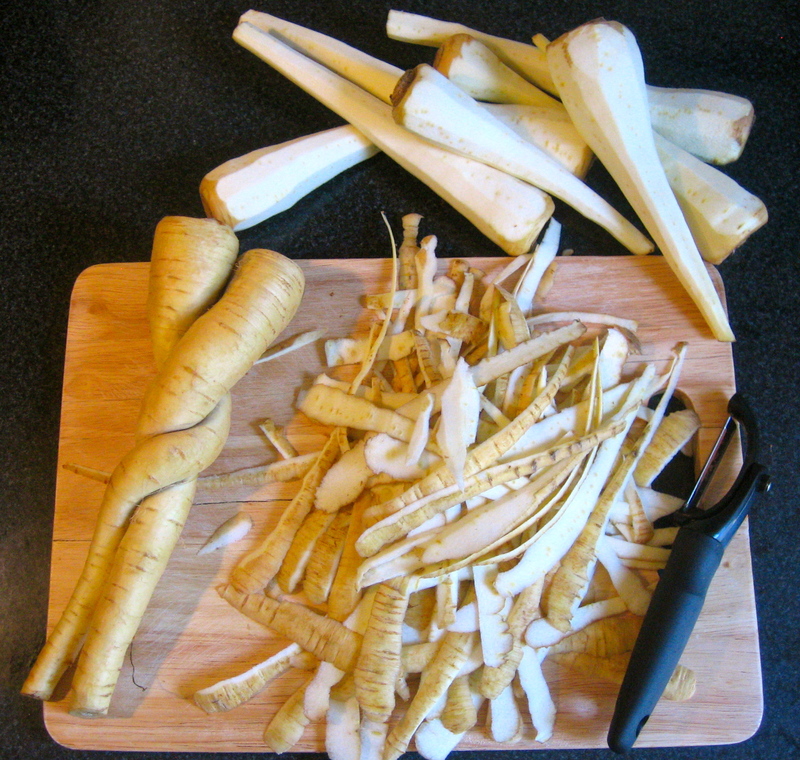 Peel your parsnips, and trim off the ends, then cut them in half lengthwise. If your parsnips have much wider top halves like mine did, you can cut them in half first, and then cut the bottom half into two, while cutting the top into four. The idea is just to try to get them somewhat the same size, so that they will cook evenly. 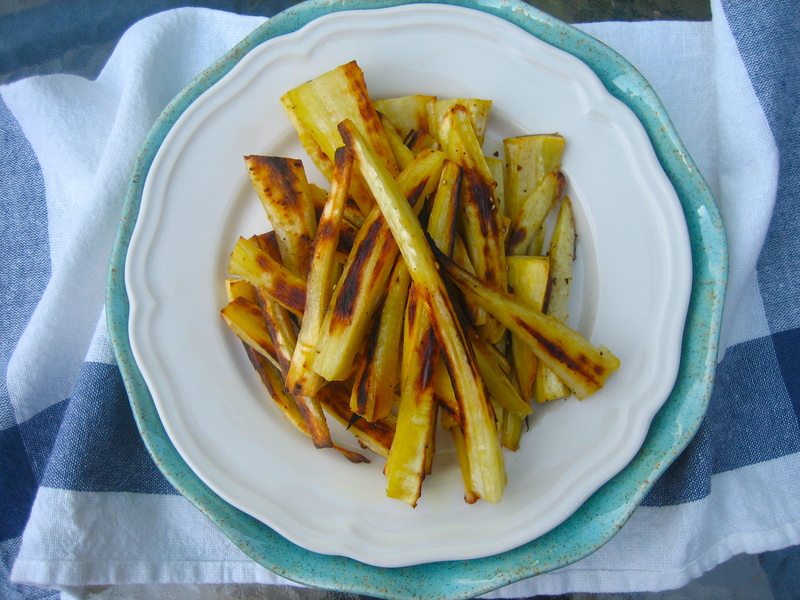 Place the parsnips on a lined baking sheet, drizzle with a little olive oil, and sprinkle with salt and pepper. Then toss them around a bit, until they are nicely coated in the glistening oil. Roast for 25-30 minutes, moving them around after 15 minutes. If this is the first time you’ve roasted parsnips, this is when you’ll fall in love, smitten by the cinnamon smell, fragrant and intoxicating, when you open the oven door. The parsnips are done when they are speckled with golden blisters, and are easily pierced with a fork. Although these are delicious and at their most aromatic while warm, that didn’t stop us from snacking on them throughout the afternoon, whenever we passed through the kitchen. Not ready to let go of winter just yet? Let Luisa cajole you into making the last apple crisp of the season. P.S. Over on her post, Molly mentions David Tanis has a version of these parsnips in his book, which he calls “Parsnips, Epiphany-Style”. That title alone just bumped his book to the top of my Amazon wish list. P.P.S. The same Molly of the Parsnips and the Ode to Winter is now fully embracing spring in this post that has pictures so startlingly beautiful, I dare you not to be moved. And if your eyes can bare to stray from the pictures long enough to read the accompanying prose, you’ll be treated to gems like this: “I’m not sure if it’s their color or form, but I’ve been glued to buds and branches like some daily horticultural Mad Men. The plot lines. The character development. The drama. Unbelievable.” And “I think it’s the juxtaposition that gets me, this coming and going, in the crosshairs. […] The shock of chartreuse against dark chocolate earth.” Oh. my. Well, gosh, now you’ve got me blushing! I’m so glad you liked the parsnips. And Tanis’ book will not disappoint. great post! did I ever tell you I love the way you write?!?!?! oh and the pictures – wow! when i try them, this will be the first recipe i use! Hi Katie! I hope you try them soon! They are surprisingly delicious! And roasting them this way really brings out their sweetness.